There are the students, alumni and volunteers from the Arava Institute who we meet on the ride. Each is a testimony to a more optimistic future for Israel and her neighbors. They embrace co-existence and partnership, and they demonstrate their commitment through their actions and behavior. These students, and the hope that they represent, are ultimately at the heart of the community being created by the Israel Ride. Meeting them is reason alone to do it again. They embrace a brighter future. There are the riders. We are a diverse group — this year’s ride included 114 riders, age 12 – 74, from four different countries and all walks of life. Some were very experienced riders, others were not. Some know Israel well, while others have never been. Each has their own reasons for doing the Israel Ride. In the course of a week, we get to know each other, we share stories, and, at times, we push or pull each other along on the ride. We become friends. I ride in memory of my stepfather, Rabbi Morris Gordon. This is exactly the type of engagement with Israel that Morris encouraged — it is active, demanding, and personal. And, it makes a difference. With each ride, I come home feeling closer to Morris and his lifetime commitment to Israel. And, there are the many people, family and friends, who support, encourage, and, in so many ways “cheer for” the ride. To be honest, I wish that they could all be there in person — we’d have a great time! Instead, I am flattered and honored by their support and good wishes. We are a good partnership. And, we are making a difference to the Arava Institute and Hazon. Whether with me in person or in spirit, it is great to ride with each of them. Finally, every ride has its own personal reasons for standing out among others. In 2009, it was the pleasure of having my oldest son, Adam, and his girlfriend, Michelle, join me for the first leg of the ride. This year, it was the pleasure of being joined on the ride by my sister in law, Lisa Hicks. This past year has also had its own personal physical challenges for me. In that context, while I didn’t fully realize it in advance, the ride was as much about finding my strength as it was about the simple joy of being in Israel, on a bike. I pedaled every inch of the most demanding part of the route, and rode over 300 miles. Not sure if I found my strength, but I sure learned something about my determination! 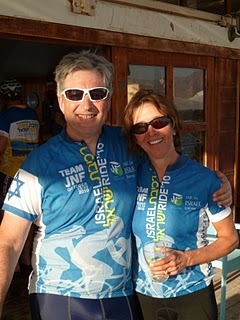 The next Israel Ride is November 8 – 15, 2011. I look forward to being there, to seeing old friends, and to making new ones. I hope that you will join me.